This is a viewpoint from Ben Vinod, Sabre‘s Chief Scientist. As Chief Scientist, I must consider which emerging technologies should be integrated into our product. If we decide to pursue a pilot, then we learn more about the technology to determine how and when to integrate. Right now, we’re thinking a lot about chatbots. Chatbots have been quite the subject of conversation this year. 2016 is the year of the chatbot, after all! The travel industry is eagerly trying to find its place within this new channel. From KLM on Messenger to the Kayak on Slack, brands across the industry are experimenting with chatbots. And this makes perfect sense: travelers prefer the immediacy of self-service and messaging. Suppliers prefer saving money on fewer call center agents. But first we as an industry must work out some critical components of this new channel. It’s vital that the traveler trusts the chatbot. There must be an implicit understanding that the bot works as well as a human. One of the challenges might be that travelers have high expectations from chatbots. The idea is that machine learning performs better than a more fallible human. On the other hand, humans are often supporting these chatbots behind the scenes. This human connection might assuage travelers skeptical of the bot’s automated capabilities. Both types of travelers need different assurances. Those with high expectations for automation seek performance and those with high trust in humans seek a personable touch. One offshoot of trust is security. The traveler must be assured of full security. Payment details, passport information and other personal data must be secure. What security do chatbots have? Is it good enough for sending payment information? Most text messaging is unencrypted. Many chatbots we’ve evaluated trade security for ease-of-use. This is where the parent platform (Slack or Messenger, for example) bears some burden. If a hacker inserts itself into the platform to siphon off traveler information, there could be quite the breach of trust. Travel brands don’t control what happens on these third-party platforms. You are at their mercy! The other component of trust is accuracy. The chatbot must be accurate and relevant. It must provide the best results for any given search. Many travelers pride themselves on being able to surface deals and master travel search. For those travelers, chatbots might not be appropriate. For the more casual traveler, the results must be more accurate than they could achieve on their own. The experience is what sets chatbots apart. A true differentiator exists in eliminating the need to sort through a cascade of results. These accurate results must also load quickly. The best chatbot experience will focus on a combination of trust, security and accuracy. Reducing the number of searches a traveler has to make to get to the golden ticket could increase satisfaction. This then boosts loyalty and top-line revenue. For corporate travelers, the chatbot experience might actually be quite valuable. 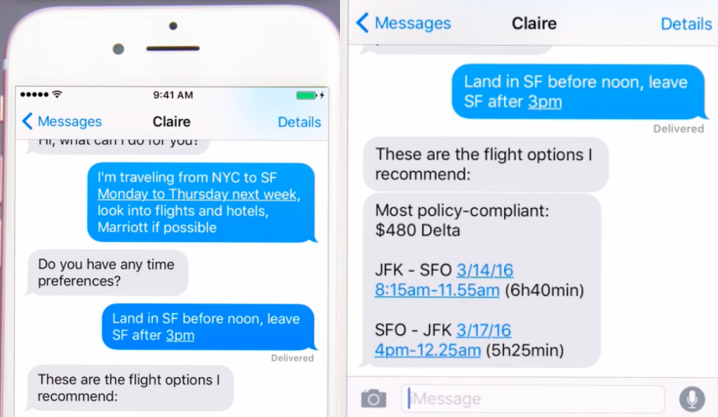 Corporate travel policies and travel history can sit within the chatbot’s rules. This drives more relevant, in-policy bookings to the front for each traveler. 30secondstofly.com’s corporate travel chatbot Claire. Because it knows who you are and your corporate policies, it can quickly return a few options from which you select. This is different from non-corporate travelers. Those casual travelers do not always have a profile with credit card and travel history. In the example above, there is little “shopping around.” First, you say what you want in natural language. Next, you get three policy-compliant options. Finally, you book one using pre-stored credit card information. Or even a dedicated virtual payment initiated right there in the interface. When it comes to processing these chats, it comes down to Natural Language Processing (NLP). There are standards, such as Stanford NLP and Apache Foundation’s OpenNLP. In current states, these tools provide a good way to break down a sentence. There’s not yet a reliable, flexible out-of-the-box for something like travel context. Dates, locations, and supplier names all appear to need plugin support. Many words and word phrases, especially in Stanford, seem to resolve to proper nouns. So once we have the sentence extracted we need to pick out these keys, hit lookups with them to decide what kind they are, and then act on them. NLP becomes appealing for preference-driven shopping, since the purpose is to provide fewer, targeted options. Yet it’s not clear that the majority of millennials would prefer to book travel via chat. Most chatbots service existing reservations rather than complex itinerary searches. A shopper gets much richer content and a real shopping experience using a browser connected to an OTA. Yet the growth in search options signals an opportunity to use technology to enhance the relevancy of search. When it comes to processing these conversations, it comes down to the technology. Travel technology brands must understand their customer touchpoints and expectations. Only then can they prioritize resources efficiently. And as technology evolves, a regular reprioritization is required. This process keeps the product road map pointing towards current and emerging traveler preferences.